Planning maintenance events in advance helps establish expectations for both you and your chosen MRO. 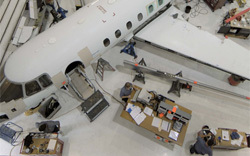 Whether or not you have an in-house flight department capable of minor inspections and maintenance on your aircraft, occasionally, you will need to visit a Maintenance Repair Organization (MRO) for larger inspections requiring specialized tooling, more available trained technicians and the hangar space to efficiently perform all required maintenance. Whether the workscope is large or small, the planning should be done well in advance in a well organized and methodical manner. The result will be a better experience and a united service expectation for both you and your chosen MRO. Preplanning helps both the operator and the service facility get what they want—a quality job done efficiently and on time. Freedom to choose a convenient downtime. High-quality job, delivered on time, for the best value. Time to dedicate the best technicians to your aircraft. Schedule the correct amount of resources. Better coordination, scheduling and parts provisioning. Time to perform at peak efficiency and quality. Every maintenance event is an opportunity to achieve maximum results with minimum downtime. Learn how to leverage scheduled and unscheduled events to your advantage through preplanning and compare key points when selecting an MRO and planning maintenance events. If you have questions about maintenance event planning, call a Duncan Aviation Sales Representative for your airframe.